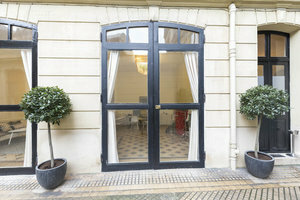 This welcoming 30 sq m space is located in the affluent area of Champs Elysées and is ideal for Showrooms and Private Sales. With a street level entrance with classic double doors, this space is both accessible and understated. The interiors are tasteful with light walls, a tiled floor, brilliant lighting fixtures and some contemporary furniture. 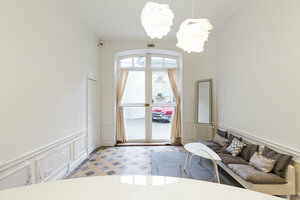 Located on a popular Avenue with wonderful Hausmannian architecture, this is a brilliant opportunity for designers and brands to curate their ideal pop-up showroom in an upmarket setting.